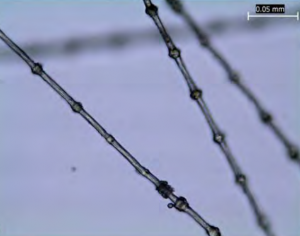 This post is by MSU Postdoc Eben Gering. Several of my most exciting workdays last year were spent rummaging through drawers of dead birds. I was on the hunt for a few dozen of the 640,000 specimens that makeup the world’s third largest bird collection. This collection resides within the Smithsonian National Museum of Natural History, but one could also say that it “lives” in the minds of the investigators who study it… Because there, like the cast of Milan Trenc’s A Night at the Museum, evolutionary processes spring to life from the inanimate artifacts that life leaves behind. A curious biologist could easily dedicate her professional life to studying and curating such a treasure trove as the Smithsonian bird collection, and during my visit there I met two remarkable women who have done precisely that. 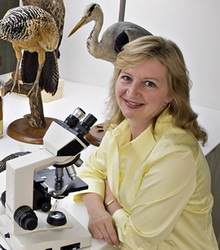 I had already made an appointment to meet with one of them, Dr. Helen James to ask what could be learned about the biology of feral chickens (the focus of my current research) from several dried specimens in the Smithsonian collection. I’ll save the details for another day; the short answer is: a lot! Dr. James is among the world’s leading avian paleontologists, a reputation that rests upon decades of extraordinarily resourceful work. 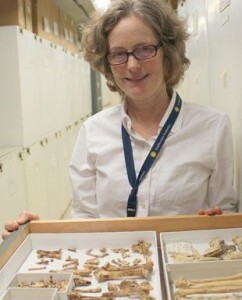 From meticulous studies of tiny bits of bone, she has pieced together much of the previously unknown evolutionary history of Pacific Oceania’s birds. Dr. James’ capabilities and reputation are likely what led someone from another museum to drop by her office during our meeting. They had brought with them several 100 million year old feathers that had been trapped (in breathtakingly pristine condition), in a recently discovered Burmese amber deposit. Would I mind if Helen took our conversation over to the feather forensics lab to have a look? No… I would not mind. For me (and probably also for you, if you are reading this blog), this was the stuff of childhood dreams. Aircraft can occasionally ingest birds into their engines. As Dr. James, her guest, and a postdoc excitedly examined the ancient feathers and sought “matches” from more recently collected material in the collections, I had an opportunity to meet the manager of the feather forensics lab, Dr. Carla Dove. Dr. Dove explained to me that, while the ancient feathers were a treat to examine, her lab is usually occupied by the study of younger, less well-preserved samples. Specifically, her team dedicates much of their effort to identifying birds from the fragmentary evidence that survives birdstrikes. These sometimes fatal accidents occur when aircraft ingest birds into their engines. Knowing the species (and therefor the biology) of the birds involved helps air traffic controllers, pilots, and engineers anticipate and avoid them. 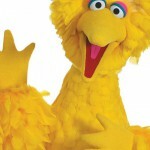 The Smithsonian has Big Bird feathers in their collection! Studies of birdstrikes offer a very compelling and straightforward example of why natural history collections, and the taxonomic experts who maintain them, are so important. Unfortunately many scientists and citizens are losing sight of the value of scientific collections. In my opinion a visit to a natural history collection is a must for any evolutionary biologist, no matter what animal, vegetable, or pathway s/he studies. We owe the very discovery of evolution to Darwin’s analysis of bird collections, and they offer unlimited opportunities for future breakthroughs. SMITHSONIAN HAS BIG BIRD FEATHERS IN THEIR COLLECTION! And so at the close of a perfect day, I was able to view the Galliformes ringed barbules (image 5) because, it turns out, the immortal and monotypic Big Bird shares surprising morphological homology with Meliagris, the turkey.